Looking for some deceit to spice up your week? 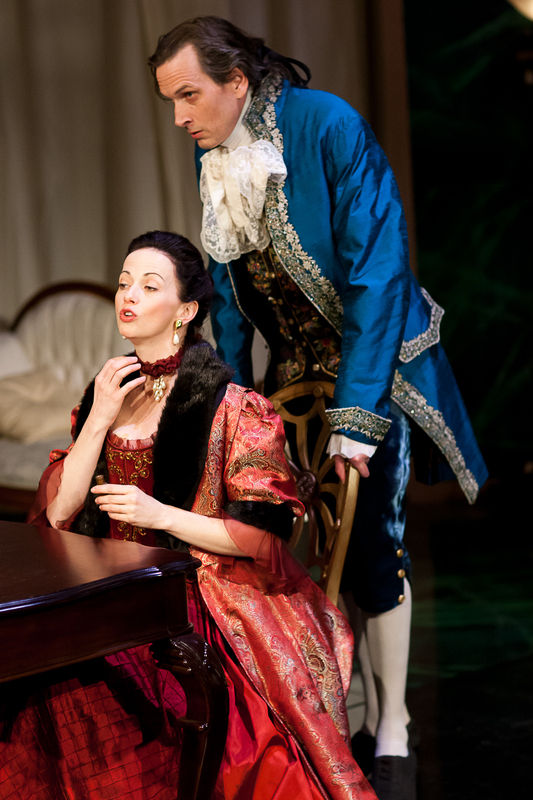 Look no further than the Torch Theater’s production of Dangerous Liaisons. Based on the 1782 epistolary novel by Pierre Choderlos de Laclos, this delightfully devilish drama presents the scathing battle of wills and desires between La Marquise de Merteuil (Stacia Rice), a wealthy widow determined to manipulate social circles to her liking, and Le Vicomte de Valmont (John Middleton), at once her rival, co-conspirator, and lover. The Torch Theater does a lovely job of bringing the novel’s exchange of letters to the stage. (The production is based on Christopher Hampton’s 1985 adaptation for the Royal Shakespeare Company. Hampton also adapted the 1988 film starring John Malkovich and Glenn Close.) Unfortunately, this production’s loveliness works to undercut its potential to shock and move. The more salacious elements of Merteuil and Valmont’s plots, and the devastating consequences they exact, could have been pushed much further by the Torch’s capable and creative team. Still, there is much to praise in the Torch’s Dangerous Liaisons. Director Craig Johnson and set designer Michael Hoover exploit the Theater Garage’s relatively small space to create the impression that the audience is eavesdropping on various plots as they unfold. This staging of the audience mirrors the eavesdropping done by many of the characters, and Hoover makes excellent use of curtains and room dividers in order to provide ample vantage points from which actors hide and spy on emerging intrigues. In one delightful scene Merteuil has Valmont hide behind a curtain in her room so that he may watch while she talks with her cousin Madame de Volanges (Linda Kelsey) about an unauthorized courtship of her daughter Cécile de Volanges (Katherine Moeller). Cécile has already become an unwitting pawn in Merteuil and Valmont’s machinations, and Merteuil’s insistence that Valmont watch as she turns the screws yet further serves as both a titillating gift to him, and a mechanism through which she entraps him in her own designs. Rice, Middleton, and Kelsey’s acting in this scene, as well as Johnson’s direction, highlights the extent to which Dangerous Liaisons offers public glimpses into private dramas. This staged version thus shares the sense of public intimacy that the exchange of letters in Laclos’ eighteenth-century novel affords. Another impressive aspect of the Torch’s production is Johnson’s choreography of entrances and exits between scenes, which helps to explicate the relationships between characters. It’s refreshing to have such plot exposition take place so effectively through movement. Also notable are Rich Harnson’s beautiful costumes, which telegraph notions of virtue and vice through cut and color. Katherine Horowitz’ sound design, as well as Ann Michaels and Matt Riehle’s musical direction and performances, add layers of moral commentary that fittingly multiply the valences of several scenes. The cast also navigates well the various social registers and rules that Dangerous Liaisons demands. Stacia Rice is particularly good in this respect, delivering a Merteuil who takes advantage of societal conventions with obvious glee, even as she too is desperately bound by them. Mo Perry is convincing and sympathetic as Madame de Tourvel, another of Valmont and Merteuil’s unfortunate pawns. Middleton’s Valmont is at his best in moments of self-congratulation or bemusement. He’s less convincing in scenes where Valmont’s cruelty is more explicit. It’s not only Middleton’s performance, but the entire production that seems to shy away from fully exploring the cruelty of this drama. The scenes of sexual and emotional manipulation seem restrained and hesitant, and thus at times veer too close to farce. This sense of hesitation stifles the arresting power of the denouement, although the final scene is creatively staged and well-acted. Despite these reservations, the Torch Theater provides a beautifully crafted and confidently executed glimpse into the plots and foibles of the eighteenth-century French aristocracy.